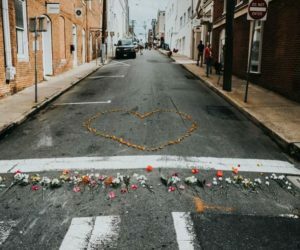 Memorial at the site of Heather Heyer’s death. Photo courtesy of Tristan Williams Photography, Charlottesville. Like many people, I spent the weekend of August 12 and 13 glued to the news coming out of Charlottesville, Virginia, where white nationalists had descended with torches and swastikas for a Unite the Right rally, prompted by the community’s moves to remove a statue of Confederate general Robert E. Lee. At home I watched photos and articles fill my Facebook feed. At the recreation center where I work out, I watched network news on the wall-mounted TV. The synergy between race- and gender-based hatred has deep roots in the United States. Hostility toward racial diversity was the driving force behind the rally — and it showed in the racial makeup of the crowds of people chanting Nazi slogans like “Sieg heil” and “blood and soil” — but I also noticed a serious lack of gender diversity as photos and videos circulated. Women were few and far between. However much I kept seeing it, though, I didn’t spend a lot of time thinking about it. I grew up half Asian in a very white community, so seeing the dynamics of race has always come easily to me — and they were taking obvious form in Charlottesville. Having grown up cis-male, though, I don’t always catch the dynamics of gender on the first pass.